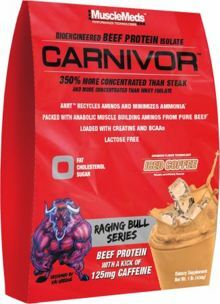 Carnivor-BPI™ [Hydrolyzed Beef Protein Isolate, Creatine Monohydrate, Bcaas (L-Leucine, L-Valine, L-Isoleucine), Anabolic Nitrogen Retention Technology™ Intermediates: GKG (Glutamine-Alpha-Ketoglutarate), OKG (Ornithine-Alpha-Ketoglutarate), AKG (Alpha-Ketoglutarate), And KIC (Alpha-Ketoisocaproate)], Maltodextrin, Hydrolyzed Gelatin, Coffee, Natural Flavor, Silica, Caffeine Anhydrous, Acesulfame Potassium, And Sucralose. Carnivor-BPI™ [Hydrolyzed Beef Protein Isolate, Creatine Monohydrate, Bcaas (L-Leucine, L-Valine, L-Isoleucine), Anabolic Nitrogen Retention Technology™ Intermediates: GKG (Glutamine-Alpha-Ketoglutarate), OKG (Ornithine-Alpha-Ketoglutarate), AKG (Alpha-Ketoglutarate), And KIC (Alpha-Ketoisocaproate)], Maltodextrin, Hydrolyzed Gelatin, Cocoa, Natural Flavor And Artificial Flavor, Salt, Silica, Caffeine Anhydrous, Acesulfame Potassium, And Sucralose. Very low calorie protein diets (below 400 calories per day) may cause serious illness or death. Do not use for weight reduction in such diets without medical supervision. Not for use by infants, children or pregnant or nursing women. Contains caffeine comparable to a cup of the leading premium coffee. Caffeine intake is not advisable in cases of high blood pressure, heart problems, pregnancy or nursing. Limit caffeine intake. Too much caffeine may cause nervousness, irritability, sleeplessness and occasionally, rapid heartbeat. For adult use only.